The NSL-F is the next generation of potentiometric technology. In addition to all of the benefits of the LN, the NSL-F offers an optional display, and does not require tuning to process media but offers advanced configuration through a PC interface or the display. The NSL-F can also be repaired in our facility and is offered in custom factory bent configurations. Additionally, the NSL-F can be ordered with an insulated tip which allows anchoring of the rod to a tank bottom for applications with heavy agitation. 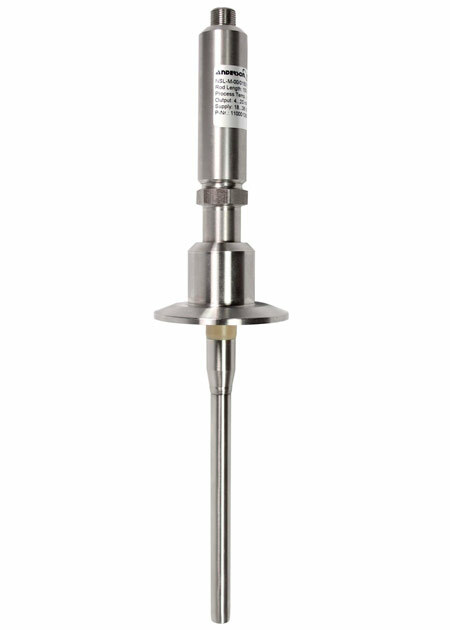 The NSL-F Potentiometric Level Transmitter provides accurate reliable measurement in applications involving viscous media or foam. While Anderson-Negele’s hydrostatic level technology provides proven accuracy and reliability in atmospheric inventory tanks, applications such as filler bowls and other shallow vessels, pressurized tanks and environments with wide temperature swings can prove challenging for pressure based level systems. Utilizing potentiometric technology, the NSL-F excels in these traditionally difficult applications. Fast reacting, the NSL-F samples interior level at ten times per second allowing accurate readings while filling or dispensing product. The stainless steel enclosure is also built to withstand the rigors of harsh environments. Resistance to vibration and moisture from wash downs is handled with typical Anderson rugged construction. The water tight and reliable quick disconnects round out this dependable design. As with all Anderson-Negele level transmitters, the NSL-F is third party verified to 3-A standards and is backed by a one-year warranty.